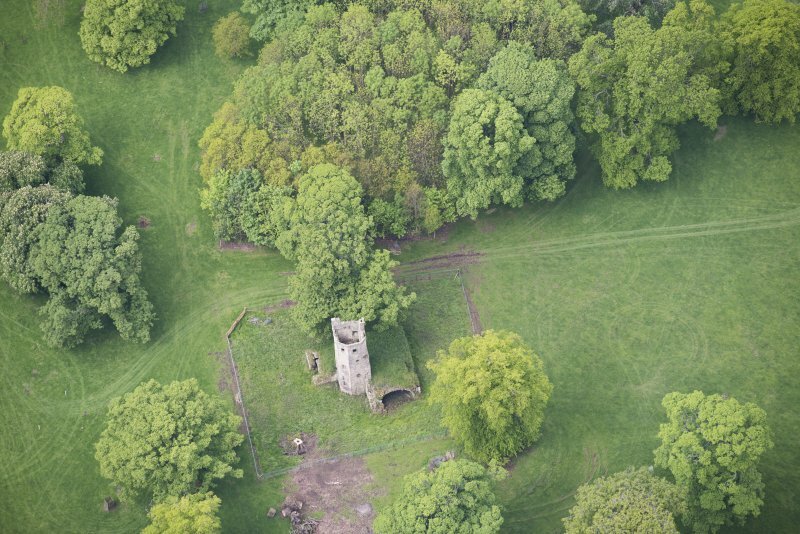 Oblique aerial view of Staneyhill Tower, looking N.
Oblique aerial view of Staneyhill Tower, looking W.
Oblique aerial view of Staneyhill Tower, looking SE. 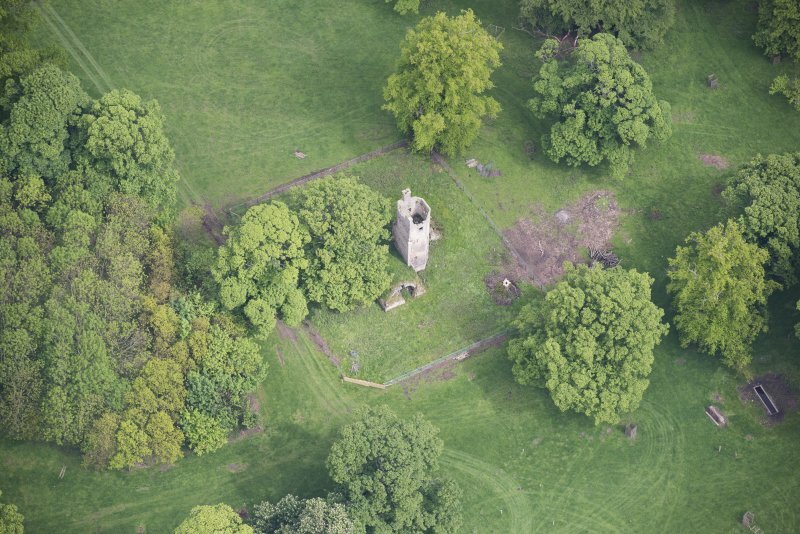 Oblique aerial view of Staneyhill Tower, looking WSW. 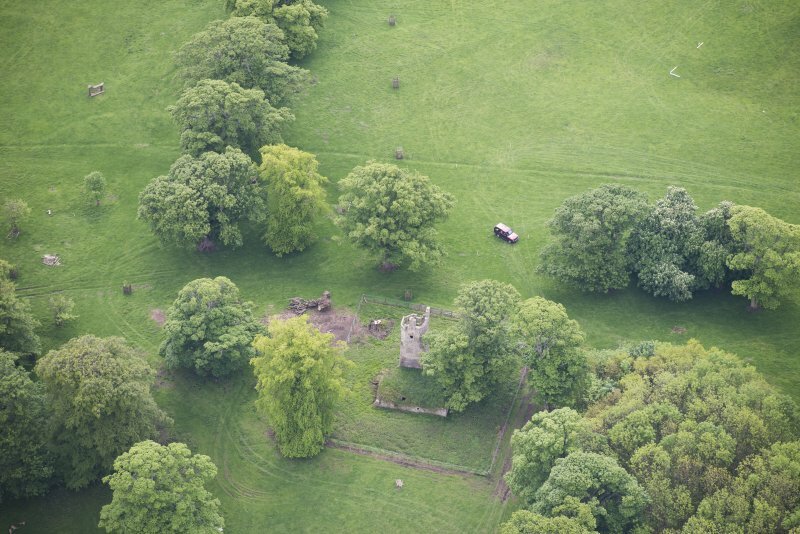 Oblique aerial view of Staneyhill Tower, looking NW. 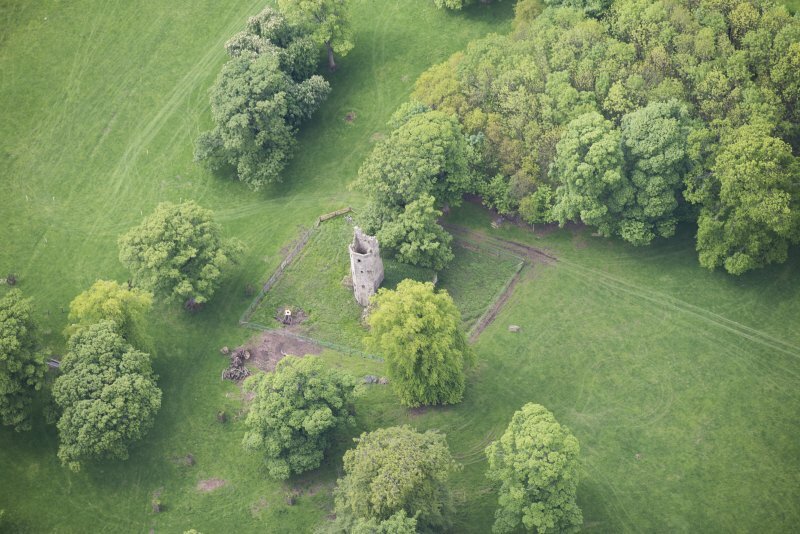 Oblique aerial view of Staneyhill Tower, looking NNE. 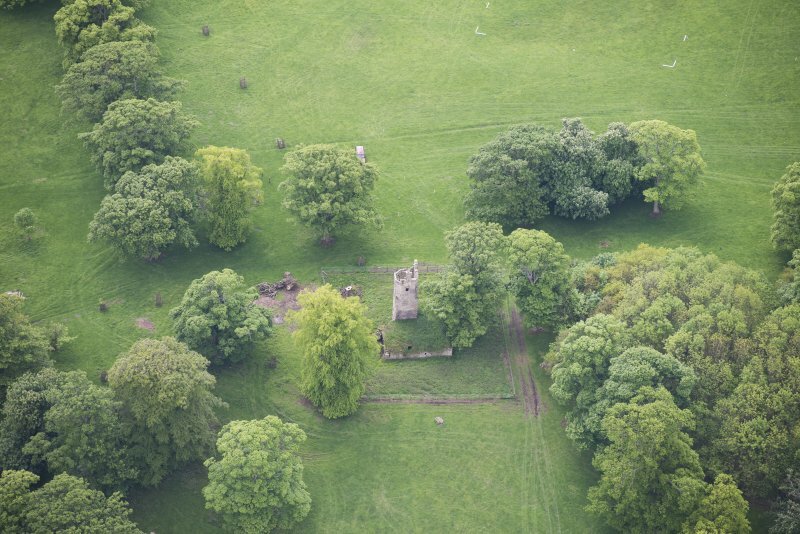 Oblique aerial view of Staneyhill Tower, looking SSE. 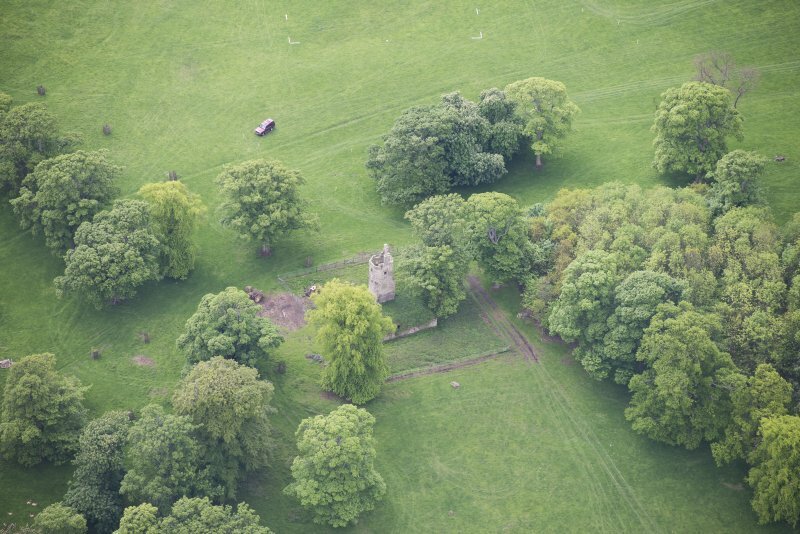 Oblique aerial view of Staneyhill Tower, looking S.
Oblique aerial view of Staneyhill Tower, looking SSW. 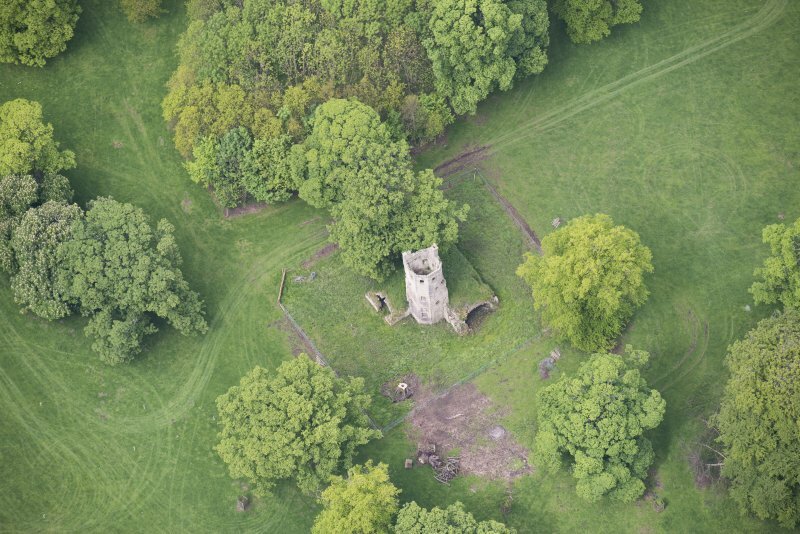 Oblique aerial view of Staneyhill Tower, looking WNW. 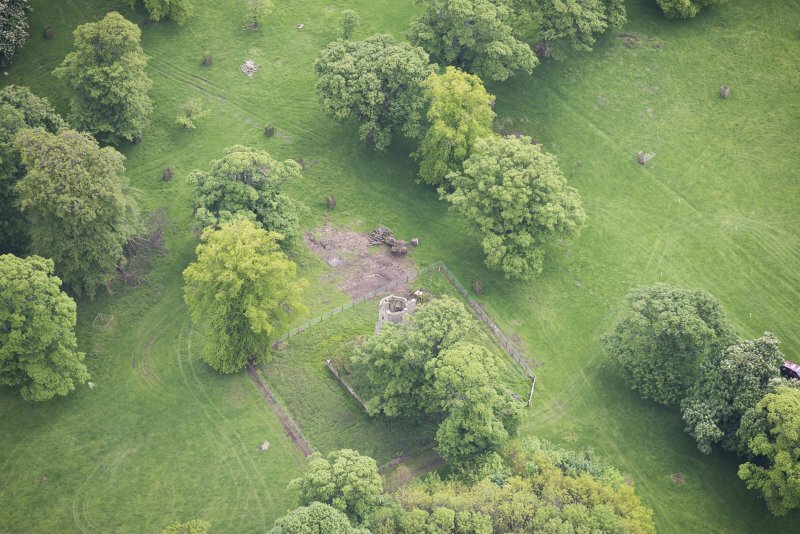 Fragmentary relic of the outstanding seat of the Shairps of Staneyhill; octagonal stair-tower with buckle-quoins, strapwork, superb broken pedimented doorway of a highly fashionable villa of the King's purse-keeper, possibly by Sir James Murray of Kilbaberton or William Ayton. 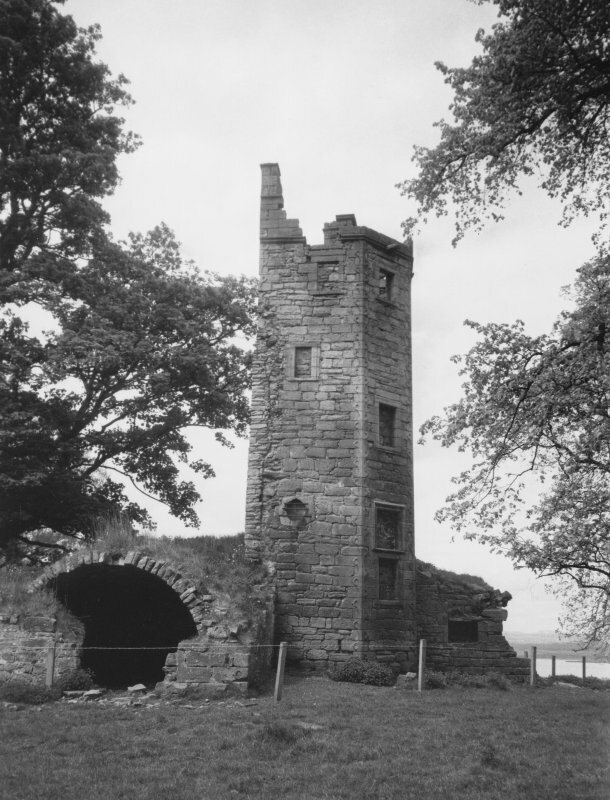 The Obelisk Gates may well be Staneyhill's. 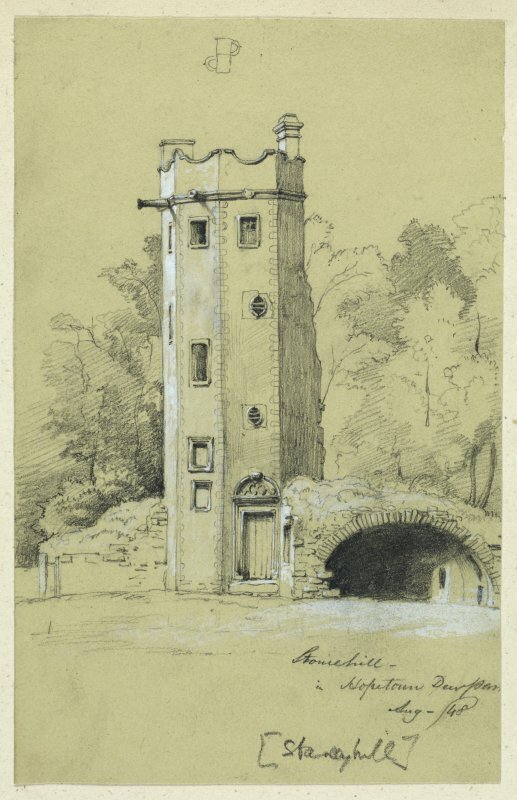 The mausoleum, 1829, by William Burn, a heavily shouldered, Gothic, vaulted and stone-roofed monument guarded by crouching and snarling griffins; the adjacent Temple of Peace a delicate wrought-iron dome supported on a ring of Corinthian columns. Butlaw Lodge, a pretty cottage ornée, projecting round entrance with classical porch, round-headed windows and conical (perhaps originally thatched) roof, has a striking Scots extension to the rear, 1972, by Michael Shepley, much influenced by Peter Womersley's doctors' surgery in Kelso (see Borders and Berwick in this series). 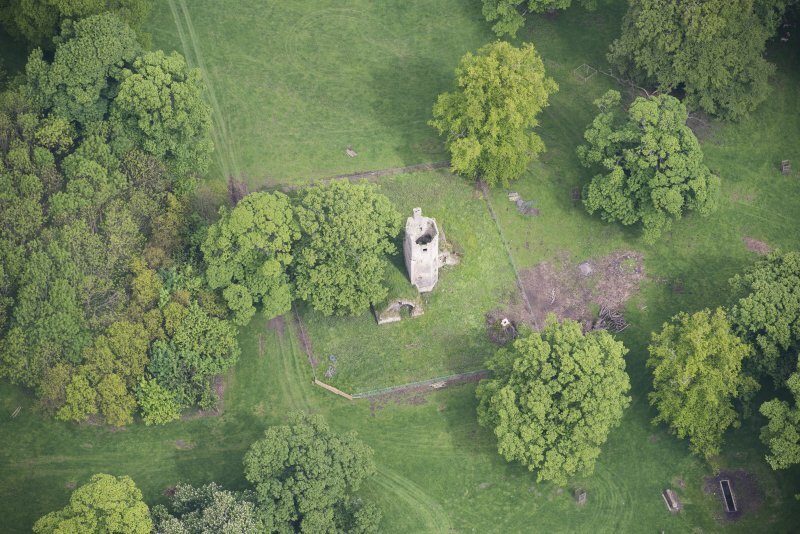 This fragment of Staneyhill Tower, a 17th century mansion, consists primarily of an octagonal (sic - hexagonal is intended) stair tower in the re-entrant angle of the building, built on the L-plan. The walls and vaults of the ground floor still, for the most part, remain. 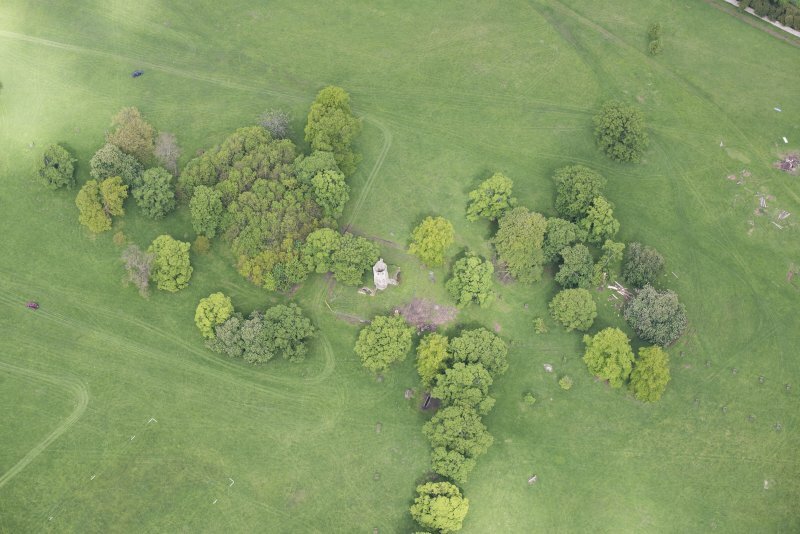 Visited by OS (JLD) 22 January 1953 and (DWR) 28 March 1974. 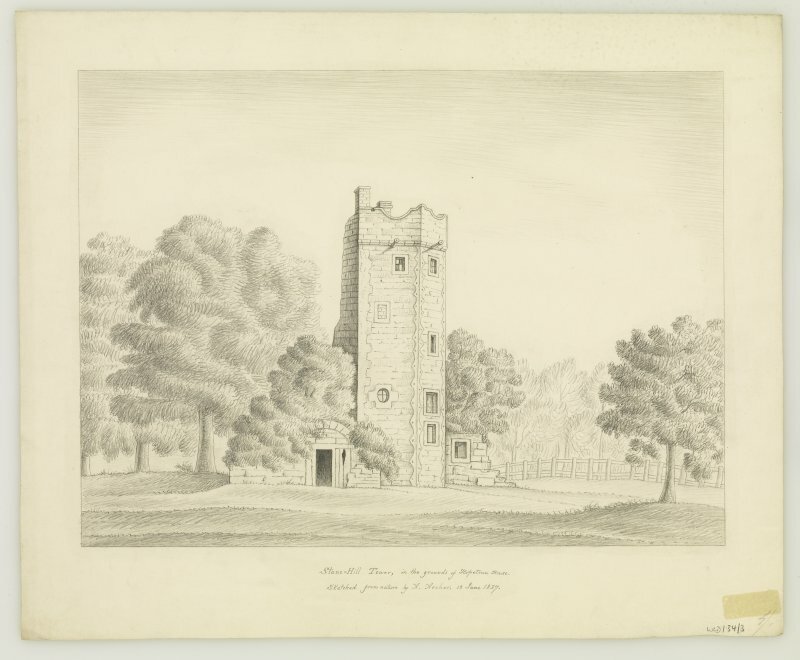 Staneyhill, c. 1630. 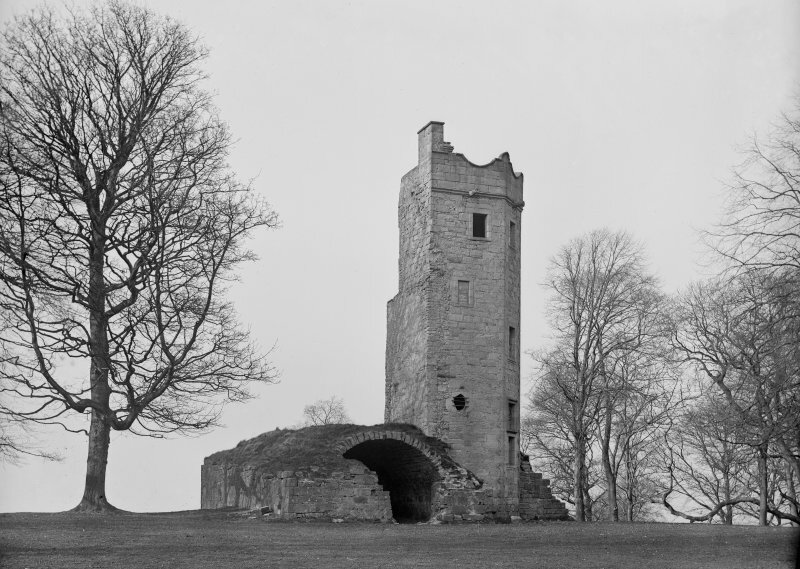 Fragmentary relic of the outstanding seat of the Shairps of Staneyhill. 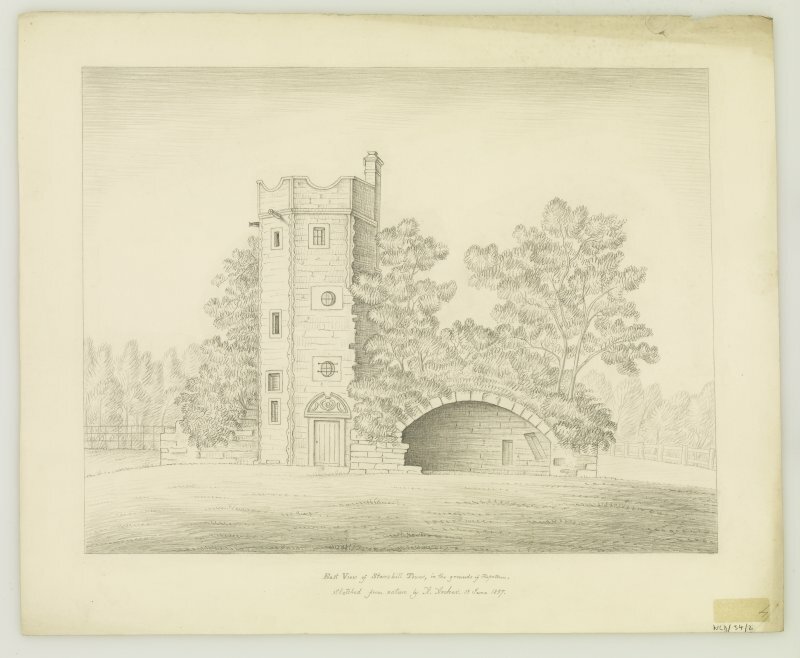 Octagonal stair-tower with buckle-quoins, strapwork, superb broken pedimented doorway of a highly fashionable house, possibly by Sir James Murray of Kilbaberton, or William Ayton. R Jaques and C McKean 1994.